Having witnessed the interesting collaboration of some fine and high-skilled musicians like Bassist Steve Sexton, drummer Gary Oppert (who both cooperated with my always favourite guitarist Matthew Mills) and guitarist Brandon Vaughn I was expecting the OSV project and when I finally got it, I witnessed some wonderful musicianship form guys who didn't just decided to invite guitarists like Mathias Holm and Paco Hernandez for fun. “Mission One” consists of 12 tracks of faultless executed Fusion/Prog/Neo-classical and at times Shred Metal, inspired mostly from our beautiful and mysterious Universe. This music could be easily characterised as the “Official Soundtrack Of Our Solar System”! Dreamy melodies, prog rhythms and a special atmosphere consists the world that the listener will meet as soon as he starts listening to the CD. It's really hard to pick a certain song, since evey single one captures a variety of positive emotions, proving at the same time that sometimes music can be intensively expressed without the help of words. The power of sweet melodies, demanding rythm breaks and inspiring riffs is steel strong and I believe that this album is not destined from musicians to musicians only. I should also add here that in “Mission One”, guitar parts are also contributed from Jean-Do Leonelli (742) and Chris Cavera (Killbot Zero). 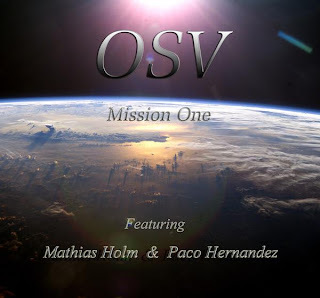 “Mission One” is distributed on several web-stores through the net, so check the band's mySpace profile (http://www.myspace.com/osproject) for additional info on how to obtain it.